Every enterprise now finds itself amidst some stage of digital transformation. Even those ahead of the curve constantly revisit and revamp their digital product portfolios, driven by rapidly emerging technologies and fast-changing customer preferences. Countless articles cover best practices, often architected by leading management and digital consultancies and finely tailored to unique industry needs. While these resources provide invaluable guidance to venturing executives, they often lack perspective - both historical and present - on the critical process by which companies secure the essential enablers of these transformations: elite talent. To shed light on these evolving business practices, I recently sat down with Shashank Saxena the co-founder and CEO of VNDLY - a next generation vendor management SaaS platform. Prior to founding VNDLY, Saxena led digital transformations for multiple Fortune 25 companies, including leading names in retail and finance. To understand why companies struggle today to recruit elite technical talent, we must look to the past. Turning back the clock 30 years, Saxena traced the roots of contingent labor practices, particularly as they relate to the history of information technology within the enterprise. He highlighted two views, both disparate from those held today, but which would, nonetheless, define the long-term relationship between enterprise and contingent labor. First, considering the concept of IT talent acquisition, contingent labor was widely considered interchangeable, and therefore a commodity. Consequently “sourcing anything third party, by default, sat squarely in procurement” Saxena noted. Driving the emerging cost-optimization mindset, GE and other large manufacturers were deploying lean practices such as six sigma, to eliminate waste - particularly extra cost - throughout company operations. This cost-saving ethos measured labor hours and indistinct widgets with equivalent austerity. Second, “IT was viewed as a cost center, and often a non-core competency.” At the time, companies built on-premise hardware, managed it with full time staff, and viewed it much like electricity or accounting - overhead required to keep day-to-day operations running. 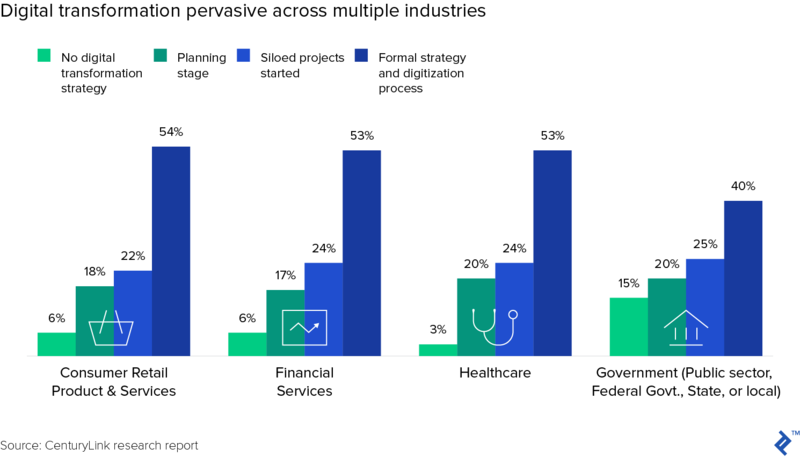 And with the emergence of lean practices, all such cost centers were subject to continuous improvement initiatives, largely focused on delivering comparable service at lower cost. Heralding the era of outsourcing, the 1990s witnessed the rise of the Indian offshore giants, vaulting IT companies such as Wipro and Infosys into global leaders. Procurement, driven by the rapid adoption of ERP systems, was already slashing costs through centralized hardware purchasing, including on-premise data centers, servers and racks - all requisite expenditures in the pre-cloud era. Such attention soon turned to IT recruitment, targeting the labor required to run the commodity hardware. At the time, according to Saxena, “the thinking went, if I can hire a java developer in India for $20 per hour, why would I pay $100 for the US equivalent?” Technical labor soon flooded out of IT departments, and into the swelling ranks across the globe. The equivalent treatment of commodity hardware and IT labor was prudent at the time. Offshore labor served the most basic IT enterprise needs, particularly managed service apps. Essentially, these workers were keeping the lights on in a back office department. They were, in fact, a commodity. However, a few trends soon dramatically shifted the role of technical contingent labor, and the suitability of procurement as the means to source it. First, offshore labor rapidly climbed the skills ladder, soon capable of performing tasks higher on the value chain. Grabbing the first rung, offshore developers began supporting quality assurance, helping enterprises test new software. Software development soon followed, calling to question the commodity label ascribed to offshore labor. Second, rising internet speeds and the iPhone-lead dawn of mobile computing fostered a wave of web and mobile-based products, leading both consumers and enterprises to demand more digital innovation. E-commerce and streaming media services became preferred consumer options. Companies that historically provided services through physical channels - such as banks and retailers - migrated online and to mobile. To accommodate shifting customer demand, companies turned to their IT departments, which were soon thrust ill-equipped into the limelight. In response to exploding demand for digital products, and enabled by new collaborative technology tools such as GitHub, IT departments aggressively ramped their use of contingent labor. “Contingent labor accounted for about 10% of the company workforce during the 90s, but that figure has increased to 30-50% today,” Saxena pointed out. Enterprises still rely predominantly on procurement to secure contingent labor. However, the average procurement department scale and category cost optimization mindset are inadequate relative to the disproportionate size of - and success metrics for - contingent labor. Growth trends have not matched pace. According to Saxena, “contingent labor has vastly exceeded the commensurate procurement headcount required to source it, leaving the later increasingly incapable of managing the former. Not many companies have appetite to add headcount to procurement.” As a result, companies depend on third-party managed service providers (MSPs) and staffing firms to fill their needs. With roles sourced by procurement - already removed one level from the hiring manager - subsequent farming out to MSPs only further distances candidate selection from this key stakeholder. MSPs generally select candidates using simple algorithms: skill keyword matches, full-time status, availability and price. Rarely during the search and evaluation process is the talent concept or the nuanced fit between candidate experience and job requirements applied to filter candidates. Instead, category optimization maximizes attributes reminiscent of lean manufacturing - including cycle time (time to fill role) and unit cost ($/hour) – but in so doing, loses sight of total cost of ownership. These myopic criteria fail to capture critical success factors, such as code quality and team fit, both of which impact product quality, and ultimately, total cost of ownership. Indeed, the cost-focused criteria that drive candidate selection paradoxically leave the hiring company vulnerable to far greater costs. With clear limitations in procurement, HR might seem an obvious alternative. Here, Saxena succinctly laid this option to rest. “For HR, contingent labor has always been out of scope,” he noted. “They have a strategic view about talent acquisition, and see their role only covering full time hires.” Even within this narrower view, “acquisition represents a small percentage of their work, with the greater focus on compensation, career planning, benefits, etc.” In summary, the top priority for HR is to “curate company culture” not optimize contingent labor acquisition. Nothing drives home a lesson like a good story. In that theme, we shifted our discussion to recent experience, during which Saxena lead a multiyear digital transformation in the retail space. In 2012, Shashank joined a Fortune 25 grocer to lead the implementation of its digital strategy. At the time, Amazon was scaling Amazon Fresh - its grocery delivery service - while Wal-Mart had recently launched labs, which would go on to develop its web and mobile products. Each venture aimed to disintermediate incumbents such as Saxena’s new employer. The immediate challenge of his strategic shift came down to people. Reflecting on his early days, Saxena asked “How can I bring in much better quality people who have the chops to compete with Amazon?” He recognized that his team needed to rapidly adopt the open-source frameworks required to build the AI- and machine learning-driven components that power e-commerce personalization. To answer that question, he and his team built a new screening process that prioritized two critical items: interviews by actual developers, and rapid response. A critical presumption underpinned his team’s approach: the best talent would leave if they didn’t engage them and react quickly. Expediency was as critical for sending the right message. Emphasizing the point, Saxena recalled, “Any good candidate would not come to work in a slow-paced, legacy environment. We needed to send a message that we were fast, like a startup.” As a result, following positive screening interviews, candidates were immediately invited for in-person follow-up and provided offers the next day. Every interaction was with a software developer, often of increasing seniority. Saxena spoke with every pending hire. Work environment and culture visibly embodied the startup atmosphere. Unlike their cubicle-bound counterparts within the IT department, Saxena’s team maintained a separate office in a different building. There they adopted familiar startup creature comforts, but more importantly, in so doing, also created an open working environment, which co-mingled managers, directors, and software developers. With title trappings stripped away, team members were encouraged to work together. Saxena’s leadership delivered rapid impact. The e-commerce platform quickly expanded, soon integrating with over 1,000 of the company’s stores. Although he has since left, the organization he built continues to enable the company to compete in an increasingly web- and mobile-driven marketplace. Don’t fight attrition. Adapt to it. The time of employees devoting multiple decades to a single company are long-lost. Instead, career tracks often lead the best talent through multiple roles and industries. Particularly for developer talent, whose skills are prized by any digital product team, shorter tenures are now the rule, rather than exception. The upshot of Saxena’s approach was two-fold. First, new hires could quickly apply their unique technology expertise to achieve the stated vision. The means by which they pursued the vision were neither pre-ordained nor confined. And, while vision alignment didn’t explicitly prevent his best employees from leaving, it did grant them the widest possible berth to operate as independent problem solvers. Second, by modularizing the project into a vision comprised of discrete objectives, Saxena could match talent to different parts of his project, easily directing new team members to continue carrying the torch. Reflecting back on our conversation, which started by contrasting procurement and HR approaches to contingent labor, followed by Saxena’s front-line experience, the question emerged: how will the story unfold for enterprise talent acquisition? Recalling a similar story played out over the past fifteen years, Saxena compared the present trend to the example of Salesforce.com displacing Siebel systems. “For many years, Siebel was the dominant CRM, sold into sales and marketing departments for multi-million dollar annual contracts. Salesforce launched at $50 per user per month, and sales teams simply signed up with their credit cards.” The theme echoed an earlier comment in our conversation, which depicted company hiring managers going directly to LinkedIn to post open positions.